The five popular Luxury Slot Machines for sale – With games of Monopoly, Wizard of Oz and Star trek to play. Home / Blog / The five popular Luxury Slot Machines for sale – With games of Monopoly, Wizard of Oz and Star trek to play. Luxury slot machines are the best gaming machines which come up for sale at many online sites. 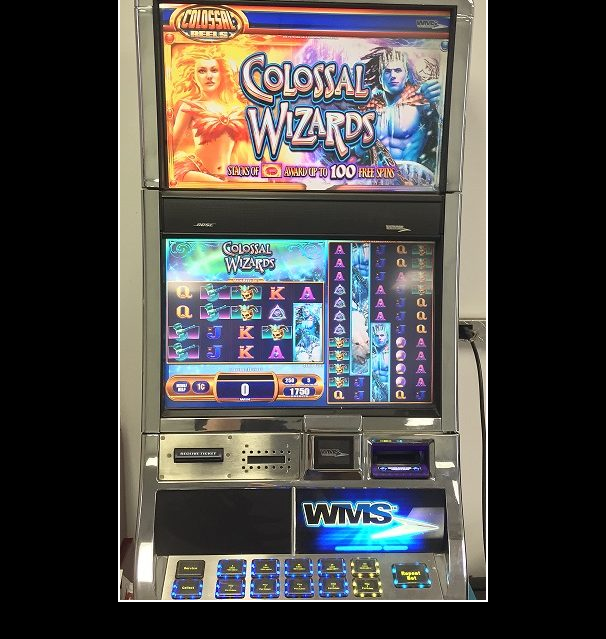 These machines are developed by WMS or Williams Bluebird and offer many popular games such as Monopoly, Wizard of Oz, and Star Trek. These slot machines come in many colors so you have many choices to select the one you want. The cabinets have a sleek design and feature two high definition 22″ screens. Games with multiple screens enhance the players experience. Each button is surrounded by colorful LED lights to enhance their appearance. Stereo sound provided by two Bose speakers which make the bonus rounds even more fun. 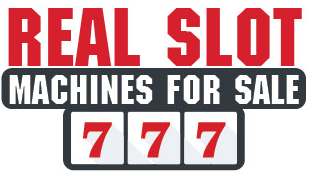 There are over 200 such luxury slot machines for sale at online realslotmachinesforsale sites. 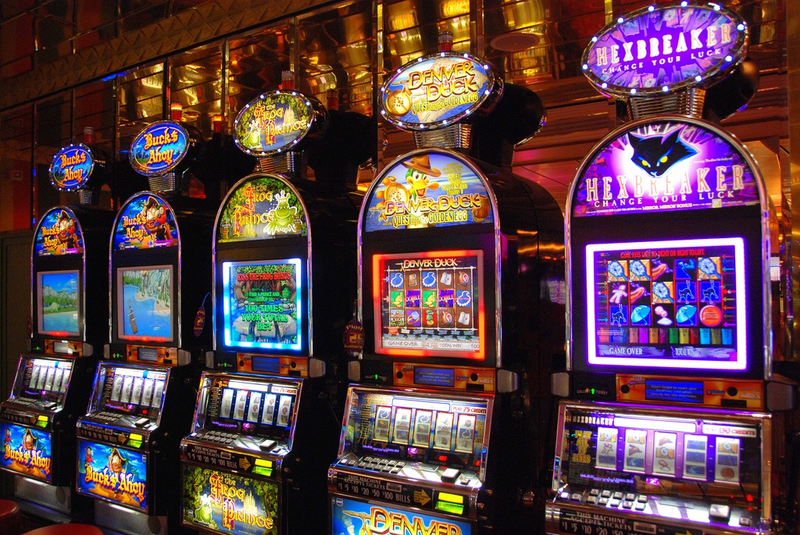 But here are five popular such machines which you will find in most of the sites that sell such reused slot machines. 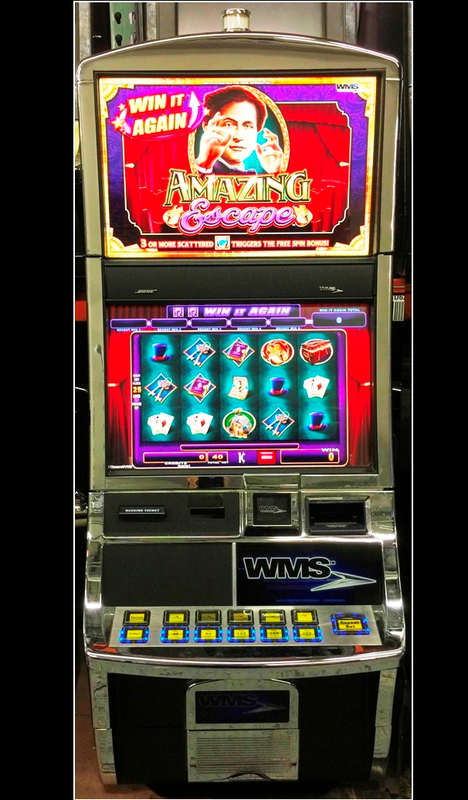 The Amazing Escape slot machine by Williams Bluebird comes in HD Dual Screens and is a 5 reel video bonus slot machine. In this game three or more scattered bonus symbols trigger the Free Spin Bonus and award 10 free spins with three scattered bonus symbols, 25 free spins with four scattered bonus symbols, or 100 free spins with five scattered bonus symbols. The bonus is re-triggered during the free spins with three or more scattered bonus symbols. During the free spins, more clumping of Magicians and wild symbols will occur. Game play can offer up to 100 free spins. You will love the dual 22” widescreen HD display, a powerful CPU NXT2 technology platform, and Next Generation Bose audio system. This is one of the best slot machines out there for ease of use and maintenance. There are several themed games available like “Star Trek”, “Lord of the Rings” and “Monopoly” to enjoy here. This machine will runs on normal 110 V household current. The power cord will run out of the back of the machine. No special adapter or wiring is needed. Home owners should plug the power cord into a surge protector since there is a computer board inside this machine. Also you can buy custom built Casino Stands but you can provide your own as well. These stands will hold a 500 pound slot machine and measures 27 inches across and 22 inches high which is regulation casino size. This machine will run on normal 110 V household current. The power cord will run out of the back of the machine. No special adapter or wiring is needed. Home owners should plug the power cord into a surge protector since there is a computer board inside this machine. You can buy this machine from eBay and other online stores and comes in price range from $2000-$3000. 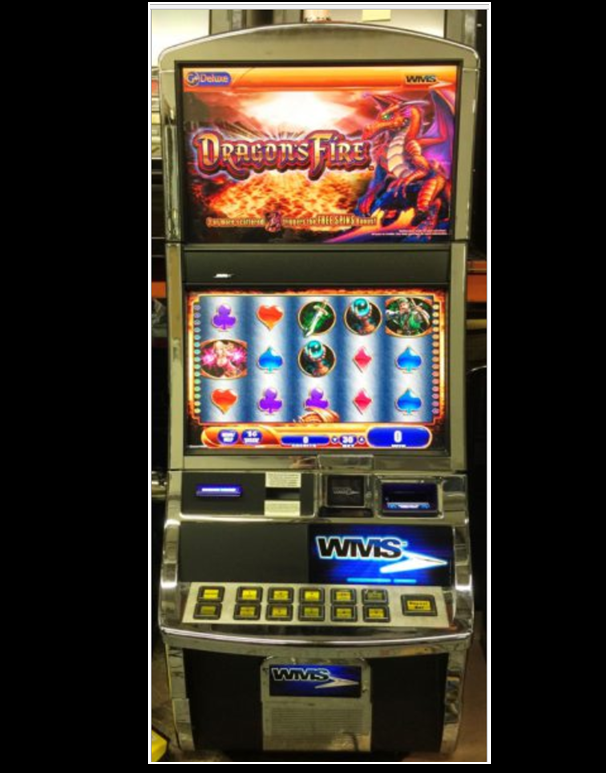 Dragons Fire is another slot machine from Williams Bluebird comes with HD Dual Screens and is a 5 reel video bonus slot. In this game also three or more scattered bonus symbols trigger the Free Spin Bonus and award 10 free spins with three scattered bonus symbols, 25 free spins with four scattered bonus symbols, or 100 free spins with five scattered bonus symbols. The bonus is re-triggered during the free spins with three or more scattered bonus symbols. During the free spins, more clumping of DRAGONS and WILD symbols will occur. Dragons Fire has mesmerizing bonus games and the game play can offer up to 100 free spins. This machine will run on normal 110 V household current and can be bought from eBay and other online sites who sell real slot machines. The price range varies from site to site. 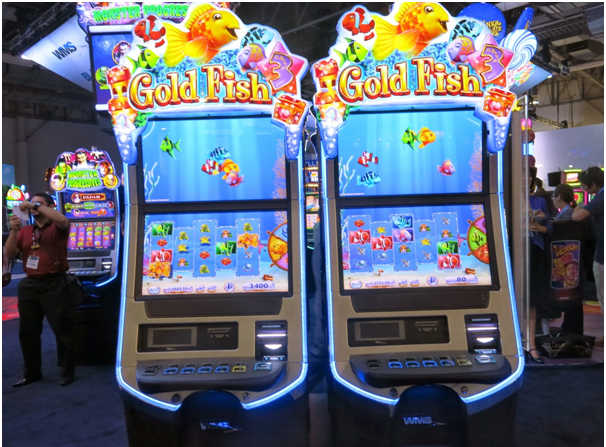 Gold Fish 2 by Williams Bluebird comes with HD Top Screen and is a 5 reel slot machine. Here fish can now swim across mechanical reels to award credits, multipliers and free spins. It’s a whole new way to play Goldfish. As in the original Goldfish game, fish bonuses can be triggered at the conclusion of any spin when the extra bonus bet is made. The Gold Fish awards free spins. Players pick a chest to reveal a number of free spins. Every time a winning combination appears on the screen during the bonus, the Gold Fish will reveal a multiplier that is applied to that spin. To add to the excitement of this bonus, the player has the chance to trigger the base game Free Spin bonus. The Red Fish awards a pick to turn three different symbols wild. Players are prompted to pick three shells on the screen to reveal three symbols and wherever those symbols appear on the reels, they are replaced with Wild Symbols, potentially creating new paylines and awarding additional credits. The Green Fish awards a picking bonus. Pick chests to collect keys and find the pearl, but watch out for the squid. The Blue Fish awards 2 to 5 spins with a multiplier up to 10x. Trigger a base game bonus, and that gets multiplied too. Exotic Treasures slot machine also from Williams Bluebird is HD Dual Screens and is a 5 reel video bonus slot machine where three or more scattered bonus symbols trigger the Free Spin Bonus and award 10 free spins. Each play spins five reels and there’s an exciting twist. When a row of mystery symbols appears the whole row will change to another symbol for your chance to match another symbol that already appears on the board. Playing the Exotic Treasures slot game is easy, just look for the treasure symbols to appear consecutively across reels and trigger your free spins. 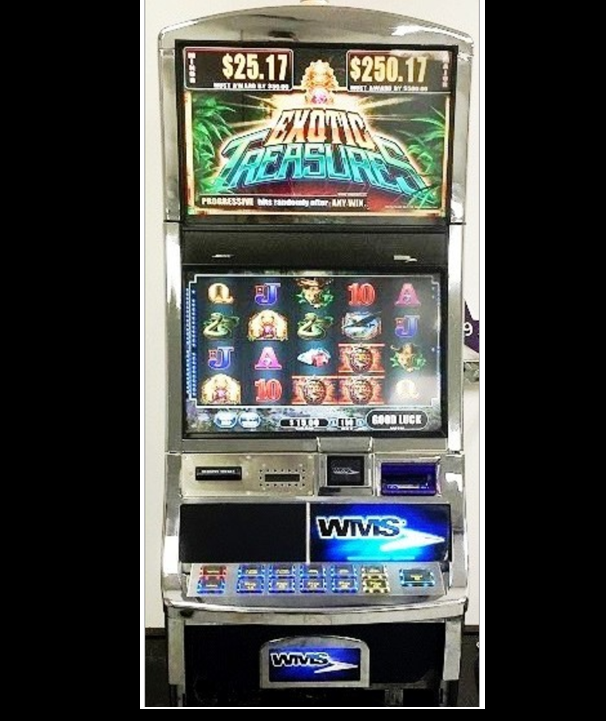 Get 2x your total bet when you land five or more scattered bonus symbols on the Exotic Treasures video screen! So with three scattered bonus symbols, 25 free spins with four scattered bonus symbols, or 100 free spins with five scattered bonus symbols. The bonus is re-triggered during the free spins with three or more scattered bonus symbols. During the free spins, more clumping of TREASURES and WILD and the play can offer up to 100 free spins. You will love the dual 22” widescreen HD displays, a powerful CPU NXT2 technology platform, and Next Generation Bose audio system. This is one of the best slot machines out there for ease of use and maintenance. Gamblers enjoy a wide selection of different styles of game play. The beautifully designed Williams Bluebird machines have been a success with slot players since their release. There are several themed games available like “Star Trek”, “Lord of the Rings” and “Monopoly.” The rest of printer, power compatibility is same as earlier above mentioned slots games. 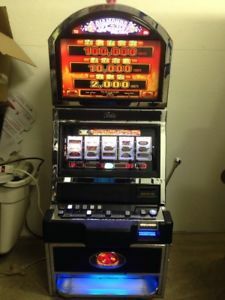 You can buy this slot machine from eBay, Amazon and at realslotmachinesforsale online where price range between $2000-$3000.